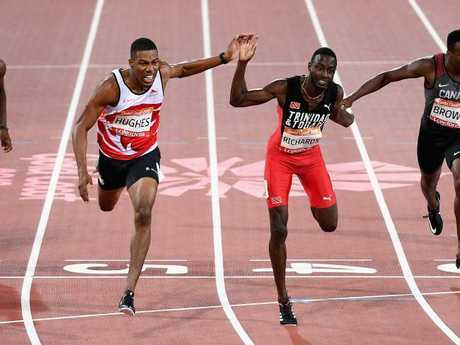 AN extraordinary final-straight body clash plunged the men's 200m final into scandal - with Englishman Zharnel Hughes brutally disqualified during his victory lap. 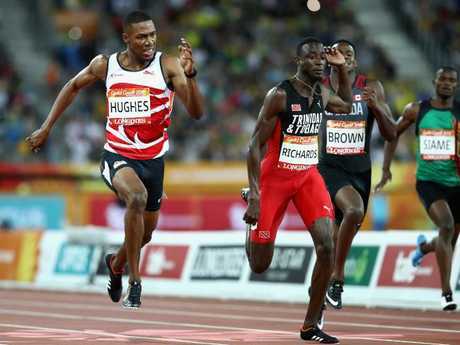 In a finish to the final which resembled an AFL marking contest, Hughes's flailing left arm made contact with Jereem Richards face, as the Trinidad and Tobago star was running him down. 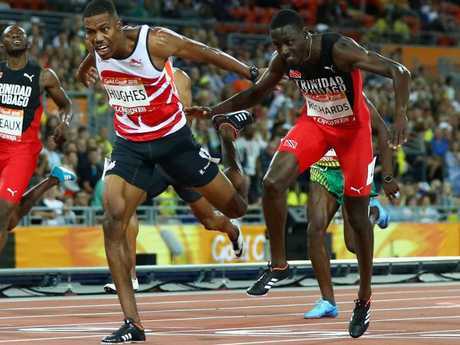 England's trouble-struck Games team appealed to the meet's jury to overturn the disqualification, which came after Hughes had finished in ungainly fashion, too close to the left side of his lane, but their efforts were rejected. "We can confirm that our appeal has been unsuccessful and Zharnel Hughes has officially been disqualified,'' Team England tweeted. Hughes, 22, and Richards, 24, had both stopped the clock at 20.12 sec (tailwind 0.9m/s), with Hughes declared the winner. 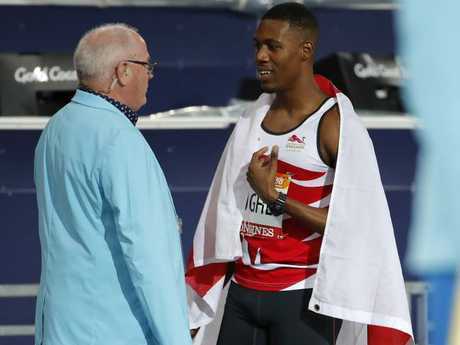 Hughes was around the back straight with an English flag in hand when an official broke the news of his disqualification. Olympic sprint champion Michael Johnson said there had been little hope for the Englishman. Sebastian Coe meanwhile said there was a technicality that would see the appeal work for England. "I am not on the jury. I have sat on juries of appeal for many years, but you are right, you can run on the line and you could be 3m ahead and run on the line and there is no material advantage," he told Channel 7. "But if you do happen to impede or clash that will be the argument. decisions are concerning their own athletes. It may well be that they will have to chase them around at the moment." The finish was an echo down the ages from the 1982 Brisbane Commonwealth Games 200m final, in which Scot Allan Wells and England's Mike McFarlane was declared a dead heat. Runners are not allowed to impede an opponent. Dual Olympic champion Sebastian Coe said on Channel 7 some of the jury members were "conflicted'' because they were from countries of Hughes or Richards. Meanwhile, Bahamas star Shaunae Miller-Uibo last night won the track showdown of the Commonwealth Games, proving her versatility in a memorable 200m final. Miller-Uibo, the Olympic 400m champion, had too much strength for a high-quality field, lowering the Games record to 22.09 sec (tailwind 0.9m/s). 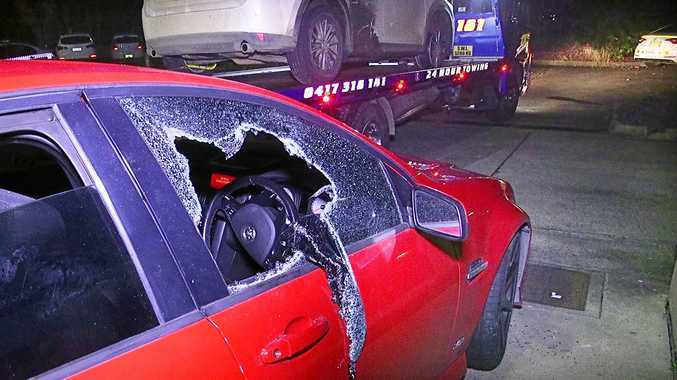 Jamaica's Olympic 100m and 200m champion Elaine Thompson, who deleted the 100m from her Gold Coast Games program, missed a medal after being put under pressure by rivals racing in inside lanes. Thompson's countrywoman Sherica Jackson (22.18) took the silver medal, with England's Dina Asher-Smith fading to third in 22.29. Thompson finished fourth in 22.30 and will rely on her country's 4x100mm relay team for a souvenir to take home from Queensland.